The RT5kVA and RT6kVA 3U Rack or Tower Uninterruptible Power Supply (UPS) offerings provide extended power protection with increased efficiency and simplified power management to safeguard high-availability of System x® and ThinkServer® server environments. With efficiency ratings of up to 98%, these compact 3U rack or tower designs can help reduce energy usage without compromising performance or reliability. The 3U Rack or Tower UPS units can be installed in a data center rack cabinet or can be used as tower UPS units in office and distributed IT environments where extended power protection is required. The RT5kVA and RT6kVA 3U Rack or Tower Uninterruptible Power Supply (UPS) offerings provide extended power protection with increased efficiency and simplified power management to safeguard high-availability of System x® and ThinkServer® server environments. With efficiency ratings of up to 98%, these compact 3U rack or tower designs can help reduce energy usage without compromising performance or reliability. The 3U Rack or Tower UPS units can be installed in a data center rack cabinet or can be used as tower UPS units in office and distributed IT environments where extended power protection is required. The 3U Rack UPS unit (RT5kVA or RT6kVA) with the Extended Battery Module is shown in Figure 1. 3U Rack or Tower UPS units feature Advanced Battery Management (ABM) technology that uses a unique three-stage charging technique that significantly extends battery service life and optimizes recharge time, compared to traditional charging methods. 3U Rack or Tower UPS units can enhance system availability with individual receptacle groups or load segments that can be programmed and controlled, which allows mission-critical devices to be prioritized during shutdown to preserve battery run time if there is a prolonged power outage. 3U Rack or Tower UPS units come standard with UPS Manager software that integrates seamlessly with the major virtualization platforms, which enables you to view and manage your entire power system from your current dashboard. It also triggers live migration during power outages and avoids data loss by gracefully shutting down virtual machines and hosts in a cluster if there is an extended power outage. Table 1 shows the part numbers and feature codes for the 3U Rack or Tower UPS models and options. The RT5kVA and RT6kVA 3U Rack or Tower UPS models do not ship with line cords. 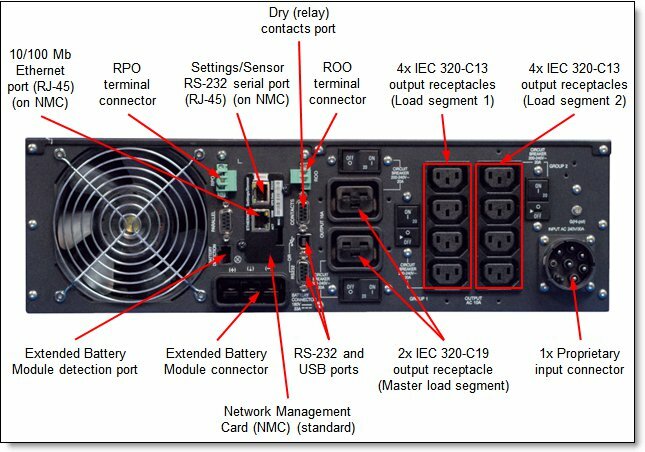 Table 2 lists the compatible line cords that are suitable for the RT5kVA 3U Rack or Tower UPS unit. 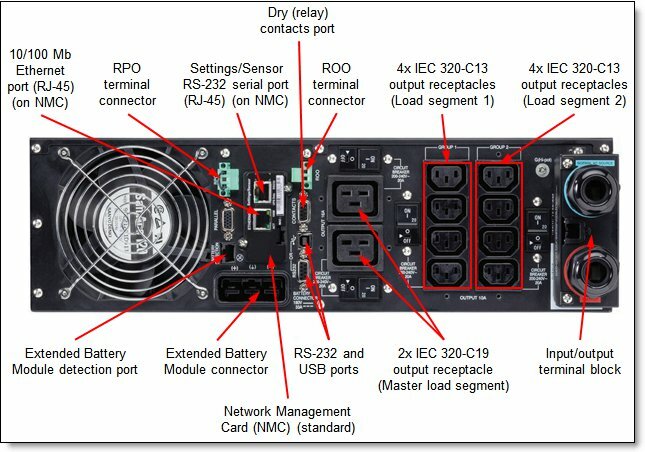 The RT6kVA 3U Rack or Tower UPS unit has a hardwired terminal block connector for AC input power. All 3U Rack or Tower UPS models come standard with an NMC installed. The NMC provides convenient, over-the-network UPS remote monitoring and management through a standard web browser or UPS Power Manager software. Figure 2 shows the UPS NMC. An optional Environmental Monitoring Probe (EMP) (part number 46M4113) is used to report local temperature and humidity values and make that information available to management tools. The EMP connects to the UPS via the NMC. The EMP is shown in Figure 3. A UPS is a device that acts as a defensive barrier between electronic equipment and incoming power problems. It conditions, regulates, and filters out power disturbances to ensure a clean power source for IT equipment. A UPS also provides battery backup if there is a power failure. In today’s high availability server environments, unplanned power outages or line quality irregularities can have a considerable financial impact on all sized businesses. The typical utility power is 99.9% available, but that means that there can be almost 9 hours of downtime a year, not to mention brownouts and other power quality problems. Selecting the right UPS can help protect against these potentially costly issues. The RT5kVA and RT6kVA 3U Rack or Tower UPS units protect against power failures, power sags, power surges, under-voltage, electrical line noise, over-voltage, frequency variation, switching transients, and harmonic distortion. Table 3 lists the technical specifications for the 5kVA and 6kVA 3U Rack or Tower UPS models. Battery management ABM technology or temperature-compensated charging method (user selectable), automatic battery test and deep discharge protection, automatic recognition of external battery units. Table 4 lists the expected period that the 3U Rack or Tower UPS models operate only on batteries, depending on the load. Note: Battery backup times are approximate and can vary with equipment, configuration, battery age, and temperature. The front of the RT5kVA and RT6kVA 3U Rack or Tower UPS units feature a 5-button graphical LCD. The display provides useful information about the UPS, load status, events, measurements, and settings. The following figure shows the control panel on the front of the 3U Rack or Tower UPS. Status information: Displays the battery status, load percentage, output power, operational mode, and load group information. Measurements: Displays the output Watts, VA, amperage, power factor, voltage, frequency, input voltage, input frequency, battery voltage, efficiency, and power usage. 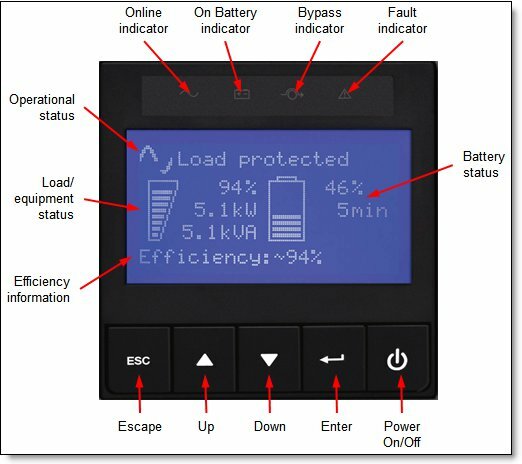 Control: Displays the battery test, reset error state, configure load segments, clear power usage measurements, and restore settings. Settings: Allows you to change product general parameters and set input and output parameters, on/off conditions, and battery configuration. Event log: Displays the stored events, selects faults, alarms and events to display, and clears events. Fault log: Displays the event log and alarm history. Identification: Displays the machine type, model, and serial number of the unit, and the firmware level of the UPS, including the NMC’s firmware level and IP address. The following figure shows the rear view of the RT5kVA 3U Rack or Tower UPS (200-240VAC) (55945KX). The following figure shows the rear view of the RT6kVA 3U Rack or Tower UPS (200-240VAC) (55946KX). The following figure shows the rear view of the 5kVA/6kVA 3U Rack or Tower Extended Battery Module (55946BX). Note: These UPS units are not supported in a maritime environment. The RT5kVA and RT6kVA 3U Rack or Tower UPS models and the Extended Battery Module (EBM) have a 3-year limited warranty. Optional features have a 1-year warranty. 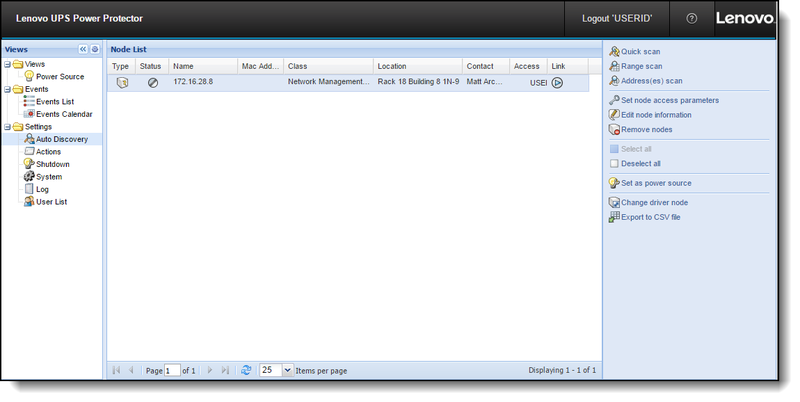 Optional software can be downloaded to be used the UPS units. This software is the UPS Power Manager (UPM) and UPS Power Protector (UPP) software. The UPM software can manage multiple devices. The UPP software is used to manage a single device. Note that a device refers to a UPS or a PDU. For up to 100 devices, a Silver license can be purchased. For up to 600 devices, a Gold license can be purchased. The following table shows the part number ordering information for each version of the UPM software. The purchase of a Silver or Gold license adds additional management features not found in the Basic license. The following table shows the UPM licenses and features for each license when managing Lenovo UPS units. UPM brings managing various power and environmental devices under control through a single, web-based interface. The UPM software solution ensures system uptime and data integrity by allowing you to monitor, manage, and control the devices on your network remotely. The UPM user interface is shown in the following figure. UPP software facilitates automatic, graceful shutdown of computers, servers, and network devices that are powered by a UPS, which saves all work-in-progress and ensures data integrity. 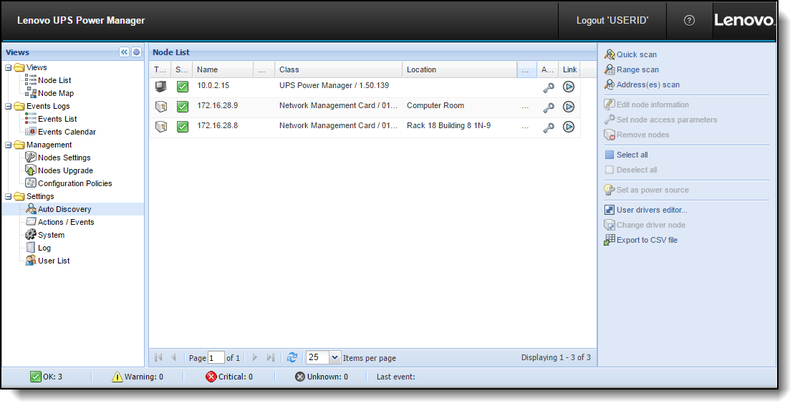 UPP’s user interface provides detailed information about connected servers and UPS units through USB and serial or network communication. The UPP user interface is shown in the following figure. The RT5kVA and RT6kVA 3U Rack or Tower UPS offerings are compatible with all System x and ThinkServer servers and other devices that require AC power. To determine the power draw of other devices such as storage and switching that will be attached to the UPS, refer to the products user manual for the maximum power draw. The RT5kVA and RT6kVA 3U Rack or Tower UPS units can be installed in the compatible rack cabinets that are listed in Table 5.